By now, we’ve all seen extensive coverage of the oil spill taking place in the Gulf. The images of the oil continuing to gush out, the news that 11 workers died in the explosion, and the heartbreaking shots of animals covered in oil have left a lot of citizens demanding someone be held responsible for this disaster. Of course, it didn’t take long for the blame game to come into play. Almost immediately, the oil giant BP, the lead project operator, tried to distance itself from this massive screw-up. BP officials instantly pointed the finger at Transocean, the company commissioned to be the drilling contractor at the time of the explosion. Of course, this company turned right around and said BP was at fault. And then, a third party started getting some blame as accusations were thrown their way saying they didn’t plug the well correctly. At one point, BP even blamed the oil spill on a faulty valve. But as Senator John Barrasso told them “Shifting the blame game doesn’t get us very far.” And he’s right … in more ways than one. Not only does this blame game not help us figure out how to avoid a similar explosion in the future, but it’s also not helping BP repair its damaged image in the eyes of the public. See, BP is operating under the belief that if they keep blaming everyone else for the explosion, the public won’t be angry with them. But that’s just not how it works. What BP fails to realize is that the public has already made up its mind regardless of the facts or legal liabilities of the key players. The “Boycott BP” protests and petitions all across the country are proof of that. Playing the blame game isn’t helping BP. It’s actually hurting them. The more they deny responsibility for the accident — even if the company is on solid legal ground for its claims that Transocean is at fault — the angrier the public gets and the more BP’s image suffers. This opens up a whole new discussion of how to handle PR for companies who outsource or work with contractors. While your legal agreements might protect you from any liability, you might find yourself having to make financial promises and taking a black eye when your contractor screws up. It remains to be seen if this is the case in this incident but certainly there will be lots to examine when the waters clear. BP is certainly aware of the backlash the company is taking, which is why they promised to cover all costs related to cleaning up the oil spill (granted, they might be required to do this by law) and all “legitimate claims.” They hoped that by doing this, the public might get off of their backs a little bit. But in the very same breath as this promise to pay, they once again blamed the contractors for the accident. Not a good idea. It’s like giving your significant other a half-hearted, insincere apology, “I’m sorry this happened babe, but if you weren’t such a @*%& this wouldn’t have happened in the first place. So, it really wasn’t my fault.” Many corporations work under the assumption that an apology equals guilt, which may be a valid concern in such a litigious world. However, there might be way to balance these concerns. The fact remains that the current scenario of shifting blame just doesn’t work. The whole situation reminds me of the Ford-Firestone debacle from several years ago. As you may remember, Firestone tires were separating at the treads, causing accidents and a very high number of deaths. In the beginning, both Ford and Firestone blamed the consumers, saying they didn’t inflate the tires correctly. Then, the two companies starting blaming each other. Both brands took a hit in the eyes of the public. 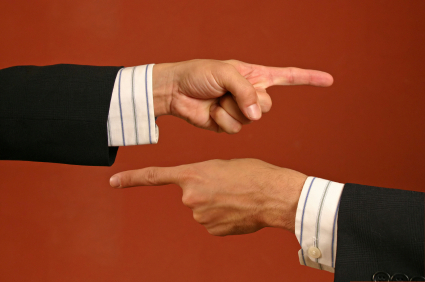 The point is this: The blame game never works. It only causes things to worsen, and it’s almost always a public relations misstep.